In today’s world of high energy costs and the need or desire to reduce our carbon foot print, domestic and industrial users alike are looking for PROVEN and reliable methods of reducing their power consumption. This is where the OptiPhase Power Optimisation Units comes into their own. OptiPhase is a PROVEN low cost solution that really works. 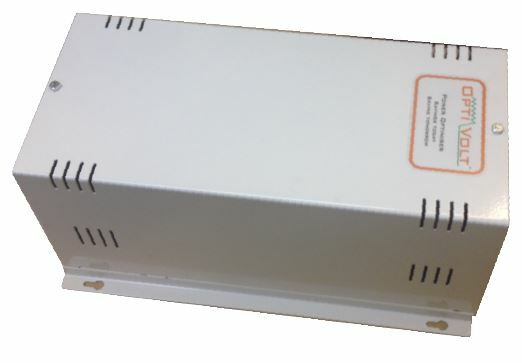 This is the 100A single phase domestic optimisation unit. It is suited for all houses from 1 bedroom studios up to 5 Bedroom houses. Its simple to connect and offers instant stavings. We prefer the term power optimisation because it best describes the product and what it does. Power optimisation is a tried and tested method of reducing your energy cost that really works. It is a reliable and proven method that gives instant savings and continues to save for now and far in to the future. Category: Power Optimisation. Tags: Opti, Opti-1-100-B, Optimiser, Transformer, Voltage optimiser.